Consider our beautiful quartz countertops in Irby if you are planning to fit a new kitchen. The stone is stunning and makes a long lasting and durable surface for the kitchen and bathroom. Once it is cut and polished it is breathtaking and adds beauty to whichever room it graces. Quartz countertops are engineered stone which have benefits that natural stone does not. It is non-porous and has no maintenance necessary whatsoever. It is also a relatively uniform colour and is made of approximately 93 % crushed stone and 7 % resin to bind it. It is pressed into slabs using a vibrocompression vacuum process. This ensures it is strong and has no air bubbles inside it. You’ll want the best kitchen you can afford and in Irby, quartz countertops will make your kitchen enviable. Engineered stone is less porous and more flexible and harder than natural stone. Less porous material is more resistant to mould and mildew and has a uniform internal structure. It does not have any cracks or flaws that may exist in natural stone and the resin allows some flexibility preventing cracking under pressure. It can easily cope with temperatures up to around 150 degrees Centigrade. It is less prone to scratching and is often more economical than marble. The quartz is an altogether harder material which is ideal for use as kitchen countertops. The material is still stone and is very heavy so installation by our experienced fitting team is necessary. 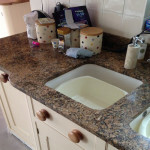 We supply some of the very best quality quartz countertops in Irby. Contact David Williams today or visit our showroom and see the gorgeous stone we have in stock. David Williams is a fully trained stone mason with over 50 years of experience in handling stone. Our business is well known for not only countertops but also fireplaces which are designed and made in our workshop. We have six dedicated craftsmen who help with the manufacture of the stone products. We are very particular about measuring up for the countertops and our team of craftsmen will manufacture the countertops in the workshop and install it in your kitchen. This entry was posted in Quartz and tagged Irby Quartz Countertops, Quartz Countertops in Irby. Bookmark the permalink.